For other uses, see Four-wheel drive (disambiguation). "Four by four" redirects here. For other uses, see Four by four (disambiguation). Four-wheel drive, also called 4×4 ("four by four") or 4WD, refers to a two-axled vehicle drivetrain capable of providing torque to all of its wheels simultaneously. It may be full-time or on-demand, and is typically linked via a transfer case providing an additional output drive-shaft and, in many instances, additional gear ranges. A four-wheeled vehicle with torque supplied to both axles is described as "all-wheel drive" (AWD). However, "four-wheel drive" typically refers to a set of specific components and functions, and intended off-road application, which generally complies with modern use of the terminology. 4WD systems were developed in many different markets and used in many different vehicle platforms. There is no universally accepted set of terminology to describe the various architectures and functions. The terms used by various manufacturers often reflect marketing rather than engineering considerations or significant technical differences between systems. SAE International's standard J1952 recommends only the term All-Wheel-Drive with additional sub classifications which cover all types of AWD/4WD/4x4 systems found on production vehicles. Four-by-four or 4x4 is frequently used to refer to a class of vehicles in general. Syntactically, the first figure indicates the total number of wheels (or more precisely: axle ends), and the second indicates the number that are powered. So 4x2 means a four-wheel vehicle that transmits engine torque to only two axle-ends: the front two in front-wheel drive or the rear two in rear-wheel drive. Similarly, a 6×4 vehicle has three axles, two of which provide torque to two axle ends each. If this vehicle were a truck with dual rear wheels on two rear axles, so actually having ten wheels, its configuration would still be formulated as 6x4. During World War II, the U.S. military would typically use spaces and a capital 'X' – like "4 X 2" or "6 X 4". Four-wheel drive (4WD) refers to vehicles with two axles providing torque to four axle ends. In the North American market the term generally refers to a system that is optimized for off-road driving conditions. The term "4WD" is typically designated for vehicles equipped with a transfer case which switches between 2WD and 4WD operating modes, either manually or automatically. All-wheel drive (AWD) historically was synonymous with "four-wheel drive" on four-wheeled vehicles, and six-wheel drive on 6×6s, and so on, being used in that fashion at least as early as the 1920s. Today in North America the term is applied to both heavy vehicles as well as light passenger vehicles. When referring to heavy vehicles the term is increasingly applied to mean "permanent multiple-wheel drive" on 2×2, 4×4, 6×6 or 8×8 drive train systems that include a differential between the front and rear drive shafts. This is often coupled with some sort of anti-slip technology, increasingly hydraulic-based, that allows differentials to spin at different speeds but still be capable of transferring torque from a wheel with poor traction to one with better. Typical AWD systems work well on all surfaces, but are not intended for more extreme off-road use. When used to describe AWD systems in light passenger vehicles, it refers to a system that applies torque to all four wheels (permanently or on demand) and/or is targeted at improving on-road traction and performance (particularly in inclement conditions), rather than for off-road applications. Some all-wheel drive electric vehicles solve this challenge using one motor for each axle, thereby eliminating a mechanical differential between the front and rear axles. An example of this is the dual motor variant of the Tesla Model S, which on a millisecond scale can control the torque distribution electronically between its two motors. Individual-wheel drive (IWD) is used to describe electric vehicles with each wheel being driven by its own electric motor. This system essentially has inherent characteristics that would be generally attributed to four-wheel drive systems like the distribution of the available torque to the wheels. However, because of the inherent characteristics of electric motors, torque can be negative, as seen in the Rimac Concept One and SLS AMG Electric. This can have drastic effects, as in better handling in tight corners. The term IWD can refer to a vehicle with any number of wheels. For example, the Mars rovers are 6-wheel IWD. Per the SAE International standard J1952, AWD is the preferred term for all the systems described above. The standard subdivides AWD systems into three categories. Part-Time AWD systems require driver intervention to couple and decouple the secondary axle from the primarily driven axle and these systems do not have a center differential (or similar device). The definition notes that part-time systems may have a low range. Full-Time AWD systems drive both front and rear axles at all times via a center (inter-axle) differential. The torque split of that differential may be fixed or variable depending on the type of center differential. This system can be used on any surface at any speed. The definition does not address inclusion or exclusion of a low range gear. On-Demand AWD systems drive the secondary axle via an active or passive coupling device or "by an independently powered drive system". The standard notes that in some cases the secondary drive system may also provide the primary vehicle propulsion. An example is a hybrid AWD vehicle where the primary axle is driven by an internal combustion engine and secondary axle is driven by an electric motor. When the internal combustion engine is shut off the secondary, electrically driven axle is the only driven axle. On-demand systems function primarily with only one powered axle until torque is required by the second axle. At that point either a passive or active coupling sends torque to the secondary axle. The Lamborghini Murciélago is an AWD that powers the front via a viscous coupling unit if the rear slips. The HMMWV is a 4WD/AWD that powers all wheels evenly (continuously) via a manually lockable center differential, with Torsen differentials for both front and rear. Two wheels fixed to the same axle turn at the same speed as a vehicle goes around curves. This either forces one to slip, if possible, to balance the apparent distance covered, or creates uncomfortable and mechanically stressful wheel hop. To prevent this the wheels are allowed to turn at different speeds using a mechanical or hydraulic differential. This allows one driveshaft to independently drive two output shafts, axles that go from the differential to the wheel, at different speeds. The differential does this by distributing angular force (in the form of torque) evenly, while distributing angular velocity (turning speed) such that the average for the two output shafts is equal to that of the differential ring gear. When powered each axle requires a differential to distribute power between the left and right sides. When power is distributed to all four wheels a third or 'center' differential can be used to distribute power between the front and rear axles. The described system handles extremely well, as it is able to accommodate various forces of movement and distribute power evenly and smoothly, making slippage unlikely. Once it does slip, however, recovery is difficult. If the left front wheel of a 4WD vehicle slips on an icy patch of road, for instance, the slipping wheel will spin faster than the other wheels due to the lower traction at that wheel. Since a differential applies equal torque to each half-shaft, power is reduced at the other wheels, even if they have good traction. This problem can happen in both 2WD and 4WD vehicles, whenever a driven wheel is placed on a surface with little traction or raised off the ground. The simplistic design works acceptably well for 2WD vehicles. It is much less acceptable for 4WD vehicles, because 4WD vehicles have twice as many wheels with which to lose traction, increasing the likelihood that it may happen. 4WD vehicles may also be more likely to drive on surfaces with reduced traction. However, since torque is divided amongst four wheels rather than two, each wheel receives approximately half the torque of a 2WD vehicle, reducing the potential for wheel slip. Many differentials have no way of limiting the amount of engine power that gets sent to its attached output shafts. As a result, if a tire loses traction on acceleration, either because of a low-traction situation (e.g., driving on gravel or ice) or the engine power overcomes available traction, the tire that is not slipping receives little or no power from the engine. In very low traction situations, this can prevent the vehicle from moving at all. To overcome this, there are several designs of differentials that can either limit the amount of slip (these are called 'limited-slip' differentials) or temporarily lock the two output shafts together to ensure that engine power reaches all driven wheels equally. Locking differentials work by temporarily locking together a differential's output shafts, causing all wheels to turn at the same rate, providing torque in case of slippage. This is generally used for the center differential, which distributes power between the front and the rear axles. While a drivetrain that turns all wheels equally would normally fight the driver and cause handling problems, this is not a concern when wheels are slipping. The two most common factory-installed locking differentials use either a computer-controlled multi-plate clutch or viscous coupling unit to join the shafts, while other differentials more commonly used on off-road vehicles generally use manually operated locking devices. In the multi-plate clutch the vehicle's computer senses slippage and locks the shafts, causing a small jolt when it activates, which can disturb the driver or cause additional traction loss. In the viscous coupling differentials the shear stress of high shaft speed differences causes a dilatant fluid in the differential to become solid, linking the two shafts. This design suffers from fluid degradation with age and from exponential locking behavior. Some designs use gearing to create a small rotational difference that hastens torque transfer. A third approach to limiting slippage is taken by a Torsen differential. A Torsen differential allows the output shafts to receive different amounts of torque. This design does not provide for traction when one wheel is spinning freely, where there is no torque, but provides excellent handling in less extreme situations. A typical Torsen II differential can deliver up to twice as much torque to the high traction side before traction is exceeded at the lower traction side. A fairly recent innovation in automobiles is electronic traction control. Traction control typically uses a vehicle's braking system to slow a spinning wheel. This forced slowing emulates the function of a limited-slip differential, and, by using the brakes more aggressively to ensure wheels are being driven at the same speed, can also emulate a locking differential. It should be noted that this technique normally requires wheel sensors to detect when a wheel is slipping, and only activates when wheel slip is detected. Therefore, there is typically no mechanism to actively prevent wheel slip (i.e., you can't "lock the differential" in advance of wheel slip), rather the system is designed to expressly permit wheel slip to occur, and then attempt to send torque to the wheels with the best traction. If preventing all-wheel slip is a requirement, this is a limiting design. Two Wheel Drive (2WD) Mode - In this mode only one axle (typically the rear axle) is driven. The drive to the other axle is disconnected. The operating torque split ratio is 0:100. Four Wheel Drive (4WD) Mode - Here, depending on the nature of torque transfer to the axles, three sub-modes (below) can be defined. Part-time Mode - The front and rear axle drives are rigidly coupled in the transfer case. Since the driveline does not permit any speed differentiation between the axles and would cause driveline wind-up, this mode is recommended only for ‘part-time’ use in off-road or loose surface conditions where driveline wind-up is unlikely. Up to full torque could go to either axle depending on the road condition and the weight over the axles. Full-time Mode - Both axles are driven at all times but an inter-axle differential permits the axles to turn at different speeds as needed. This allows the vehicle to be driven ‘full-time’ in this mode, regardless of the road surface, without fear of driveline wind-up. With standard bevel gear differentials the torque split is 50:50. Planetary differentials can provide asymmetric torque splits as needed. A system that operates permanently in the full-time mode is sometimes called ‘All-the-Time 4WD’, 'All-Wheel-Drive' or ‘AWD’. If the inter-axle differential is locked out then the mode reverts to a ‘part-time mode’. On-Demand Mode - In this mode the transfer case operates primarily in the 2WD mode. Torque is transferred to the secondary axle as needed by modulating the transfer clutch from ‘open’ to a rigidly coupled state while avoiding any driveline wind-up. The torque modulation may be achieved by active electronic/hydraulic control systems, or by passive devices, based on wheel slip or wheel torque, as described in the section on traction control systems. The 1903 Spyker 60-HP was the world's first 4WD, that was directly powered by an internal combustion engine, and the first 4WD race-car. In 1893, before the establishment of a modern automotive industry in Britain, English engineer Bramah Joseph Diplock patented a four-wheel-drive system for a steam-powered traction engine, including four-wheel steering and three differentials, which was subsequently built. The development also incorporated Bramah's Pedrail wheel system in what was one of the first four-wheel-drive automobiles to display an intentional ability to travel on challenging road surfaces. It stemmed from Bramagh's previous idea of developing an engine that would reduce the amount of damage to public roads. Ferdinand Porsche designed and built a four-wheel-driven electric vehicle for the k. u. k. Hofwagenfabrik Ludwig Lohner & Co. in Vienna in 1899, presented to the public during the 1900 World Exhibition in Paris. The vehicle was a series hybrid car, that used an electric hub motor at each wheel, powered by batteries, which were in turn charged by a gasoline-engine generator. It was clumsily heavy and due to its unusual status the so-called Lohner-Porsche is not frequently given its credit as the first four-wheel-driven automobile. The Jeffery / Nash Quad was the world's first 4WD vehicles produced in five-figure numbers (1913–1928). The world's first four-wheel drive car directly powered by an internal combustion engine, and the first with a front-engine, four-wheel-drive layout was the Dutch Spyker 60 H.P. Commissioned for the Paris to Madrid race of 1903, it was presented that year by brothers Jacobus and Hendrik-Jan Spijker of Amsterdam. The two-seat sports car featured permanent four-wheel drive and was also the first car ever equipped with a six-cylinder engine, as well as four-wheel braking. Later used as a hill-climb racer, it is now an exhibit in the Louwman Museum (the former Nationaal Automobiel Museum) in the Hague, the Netherlands. Designs for four-wheel drive in America came from the Twyford Company of Brookville, Pennsylvania in 1905, six were made there around 1906; one still exists and is displayed annually. The Reynolds-Alberta Museum has a four-wheel-drive vehicle, named "Michigan", from 1905 in an unrestored storage. The first four-wheel drive vehicles to go into mass-production were built by (what became) the American Four Wheel Drive Auto Company (FWD) of Wisconsin, founded in 1908  (not to be confused with the term "FWD" as an acronym for front-wheel drive). Along with the 2-ton Nash Quad (see below), the 3-ton FWD Model B became a standard military four-wheel-drive truck for the U.S. Army in World War I. Some 16,000 FWD Model B trucks were built for the British and American armies during World War I – about half by FWD and the rest by other licensed manufacturers. Only about 20 percent of the trucks built were four-wheel-drives, but the 4x4s were more often on the front lines. Approximately 11,500 of the Jeffery / Nash Quad trucks were built for similar use between 1913 and 1919. The Quad not only came with four-wheel drive and four-wheel brakes, but also featured four-wheel steering. The Quad was one of the first successful four-wheel drive vehicles ever to be made, and its production continued for 15 years with a total of 41,674 units made by 1928. Daimler-Benz also has a history in four-wheel drive. After the Daimler Motoren Gesellschaft had built a four-wheel-driven vehicle called Dernburg-Wagen, also equipped with four-wheel steering, in 1907, that was used by German colonial civil servant, Bernhard Dernburg, in Namibia; Mercedes and BMW, in 1926, introduced some rather sophisticated four-wheel drives, the G1, the G4 and G4 following. Mercedes and BMW developed this further in 1937. The American Marmon-Herrington Company was founded in 1931 to serve a growing market for moderately priced four-wheel-drive vehicles. Marmon-Herrington specialized in converting Ford trucks to four-wheel drive and got off to a successful start by procuring contracts for military and commercial aircraft refueling trucks, 4×4 chassis for towing light weaponry, and an order from the Iraqi Pipeline Company for what were the largest trucks ever built at the time. The early Marmon-Herringtons proved to be the exception to the rule — 4WD cars and trucks developed in the 1930s were mainly going to be built for governments, with (future) warfare applications in mind. Dodge developed its first four-wheel drive truck in 1934 — a military 1½ ton designated K-39-X-4(USA), of which 796 units were built for the U.S. Army in several configurations. Timken supplied front axles and transfer-cases, added to militarized a civilian truck. The Timken transfer case was the first part-time design, that allowed the driver to engage or disengage four-wheel drive using a lever inside the cabin. In spite of the limited 1930s U.S. military budgets, the ’34 truck was liked well-enough that a more modern 1½ tonner was developed, and 1,700 RF-40-X-4(USA) trucks were produced in 1938, and 292 TF-40-X-4(USA) in 1939. Starting in 1936, Japanese company Tokyu Kurogane Kogyo built approximately 4,700 four-wheel-drive roadsters, called the Kurogane Type 95 reconnaissance car, used by the Imperial Japanese Army from 1937 until 1944, during the Second Sino-Japanese War. Three different bodystyles were manufactured; a 2-door roadster, a 2-door pickup truck and a 4-door phaeton, all equipped with a transfer case that engaged the front wheels, powered by a 1.3 litre, 2-cylinder, air-cooled OHV V-twin engine. The 1937 Mercedes-Benz G5 and BMW 325 4×4 featured full-time four-wheel drive, four-wheel steering, three locking differentials, and fully independent suspension. They were produced because of a government demand for a four-wheel-drive passenger vehicle. The modern G-series/Wolf such as the G500 and G55 AMG still feature some of the attributes, with the exception of fully independent suspension since it can compromise ground clearance. The Unimog is also a result of Mercedes 4x4 technology. The first Russian produced four-wheel-drive vehicle, also in part for civilian use, was the GAZ-61, developed in the Soviet Union in 1938. "Civilian use" may be a bit of a misnomer, as most if not all were used by the Soviet government and military (as command cars), but the GAZ-61-73 version is the first four-wheel drive vehicle with a normal closed sedan body. Elements of the chassis were used in subsequent military vehicles such as the 1940 GAZ-64 and the 1943 GAZ-67, as well as the post-war GAZ-69, and the properly civilian GAZ-M-72, based on the rear-wheel drive GAZ-20 "Victory" and built from 1955-1958. 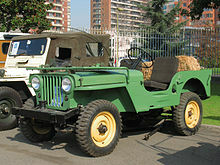 Soviet civilian life did not allow the proliferation of civilian products such as the Jeep in North America, but through the 1960s the technology of Soviet 4×4 vehicles stayed on par with British, German, and American models, even exceeding it in some aspects, and for military purposes just as actively developed, produced and used. One deciding factor had to do with availability of certain critical components, like transfer cases and especially constant-velocity joints, not used much on commercial vehicles,[nb 1] but all-wheel drive vehicles all needed these; plus additionally, they would use two or three times the amount of driven axles, meaning more gears to cut for all the differentials. Produced up to the war by a few specialized firms with limited capacity, from spring 1942 Ford, Dodge and Chevrolet joined in fabricating these in a quantity more than a 100-fold greater than in 1939. 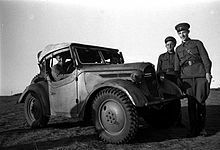 Although Russia had their own jeep-like vehicle (the GAZ-64) up and running in 1940, a year earlier than the American jeep – in the early years of the war, they relied significantly on Lend-Lease vehicles, provided by the western allies. In 1943 they launched a further developed version: the GAZ-67. By contrast, the Axis powers' closest equivalent to the jeep, the VW Kübelwagen, of which only some 50,000 were built, though being equipped with portal gear hubs, only had rear-wheel drive. Willys introduced the model CJ-2A in 1945, the first full-production four-wheel drive vehicle for sale in the general marketplace. Thanks to the ubiquitous World War II jeep's success, its rugged utilitarianism set the pattern for many four-wheel drive vehicles to come. Hot on its heels, Dodge also started production of the civilian 4WD Power Wagon trucks, for the 1946 model year. Both the Willys and the Dodge were developed directly from their WW II predecessors. Equally boxy to the Jeep, and also inline-4 powered, the Land Rover appeared at the Amsterdam Motor Show in 1948. Originally conceived as a stop-gap product for the struggling Rover car company, despite chronic under-investment it succeeded far better than their passenger cars. Inspired by a Willys MB – the ubiquitous WWII “jeep” – that was frequently run off-road on the farm belonging to chief engineer Maurice Wilks, Land Rover developed the more refined yet still off-road capable luxury 4WD Range Rover in the 1970s. With the acquisition of the "Jeep" name in 1950 Willys had cornered the brand. Its successor, Kaiser Jeep, introduced a revolutionary 4WD wagon called the Wagoneer in 1963. Not only was it technically innovative, with independent front suspension and the first automatic transmission coupled to 4WD, it was equipped and finished as a regular passenger automobile. In effect, it was the ancestor of the modern SUV. The luxury Rambler or Buick V8s powered Super Wagoneer produced from 1966 to 1969 raised the bar even higher. Jensen applied the Formula Ferguson (FF) full-time all-wheel-drive system to 318 units of their Jensen FF built from 1966 to 1971, marking the first time 4WD was used in a production GT sports car. While most 4WD systems split torque evenly, the Jensen split torque roughly 40% front, 60% rear by gearing the front and rear at different ratios. American Motors (AMC) acquired Kaiser's Jeep Division in 1970 and quickly upgraded and expanded the entire line of off-road 4WD vehicles. With its added roadworthiness, the top range full-size Grand Wagoneer continued to compete with traditional luxury cars. Partially hand-built, it was relatively unchanged during its production through 1991, even after Chrysler's buyout of AMC. Subaru introduced the category-expanding Leone in 1972, an inexpensive compact station wagon with a light-duty, part-time four-wheel drive system that could not be engaged on dry pavement. In September AMC introduced Quadra Trac full-time AWD for the 1973 model year Jeep Cherokee and Wagoneer. Thanks to full-time AWD, which relieved the driver of getting out to lock hubs and having to manually select between 2WD and 4WD modes, it dominated all other makes in FIA rally competition. Gene Henderson and Ken Pogue won the Press-on-Regardless Rally FIA championship with a Quadra Trac equipped Jeep in 1972. American Motors introduced the innovative Eagle for the 1980 model year. These were the first American mass production cars to use the complete front-engine, four-wheel drive system. The AMC Eagle was offered as a sedan, coupe, and station wagon with permanent automatic all-wheel-drive passenger models. The new Eagles combined Jeep technology with an existing and proven AMC passenger automobile platform. They ushered a whole new product category of "sport-utility" or crossover SUV. AMC's Eagles came with the comfort and high-level appointments expected of regular passenger models and used the off-road technology for an extra margin of safety and traction. The Eagle's thick viscous fluid center differential provided quiet and smooth transfer of power that was directed proportionally to the axle with the greatest traction. This was a true full-time system operating only in four-wheel drive without undue wear on suspension or driveline components. There was no low range in the transfer case. This became the forerunner of the designs that followed from other manufacturers. The automobile press at the time tested the traction of the Eagles and described it as far superior to the Subaru's and that it could beat many so-called off-road vehicles. Four Wheeler magazine concluded that the AMC Eagle was "The beginning of a new generation of cars." The Eagles were popular (particularly in the snowbelt), had towing capacity, and came in several equipment levels including sport and luxury trims. Two additional models were added in 1981, the sub-compact SX/4 and Kammback. A manual transmission and a front axle-disconnect feature were also made available for greater fuel economy. During 1981 and 1982 a unique convertible was added to the line. The Eagle's monocoque body was reinforced for the conversion and had a steel targa bar with a removable fiberglass roof section. The Eagle station wagon remained in production for one model year after Chrysler acquired AMC in 1987. Total AMC Eagle production was almost 200,000 vehicles. Audi also introduced a permanently all-wheel-driven road-going car, the Audi Quattro, in 1980. Audi's chassis engineer, Jörg Bensinger, had noticed in winter tests in Scandinavia that a vehicle used by the German Army, the Volkswagen Iltis, could beat any high-performance Audi. He proposed developing a four-wheel-drive car, that would also be used for rallying to improve Audi's conservative image. The Audi Quattro system became a feature on production cars. In 1987, Toyota also developed a car built for competition in rally campaigns. A limited number of road-going FIA Homologation Special Vehicle Celica GT-Four (known as Toyota Celica All-Trac Turbo in North America) were produced. The All-Trac system was later available on serial production Toyota Camry, Toyota Corolla, and Toyota Previa models. Some of the earliest mid-engined four-wheel-drive cars were the various road-legal rally cars made for Group B homologation, such as the Ford RS200 made from 1984 to 1986. In 1989, niche maker Panther Westwinds created a mid-engined four-wheel-drive, the Panther Solo 2. In the United States, as of late 2013, AWD vehicles comprised 32 per cent of new light vehicle sales, up five per cent since 2008. This is in large part due to the popularity of the crossover. Most crossovers offer the popular technology, in spite of it increasing vehicle price and fuel consumption. Car manufacturers have inundated consumers with marketing proclaiming AWD as a safety feature, although the advantage of AWD over FWD is in accelerating, not braking or steering. Tests have shown that though AWD gives improved acceleration in wintery conditions, it does not help with braking. In 2008, Nissan introduced the GT-R featuring a rear-mounted transaxle. The AWD system requires two drive shafts, one main shaft from the engine to the transaxle and differential and a second drive shaft from the transaxle to the front wheels. Spyker is credited with building and racing the first ever four-wheel drive racing car, the Spyker 60 HP in 1903. Bugatti created a total of three four-wheel-drive racers, the Type 53, in 1932, but the cars were notorious for having poor handling. Miller produced the first 4WD car to qualify for the Indianapolis 500, the 1938 Miller Gulf Special. Ferguson Research Ltd. built the front-engine P99 Formula One car that actually won a non-World Championship race with Stirling Moss in 1961. In 1968, Team Lotus raced cars in the Indy 500 and three years later in Formula 1 with the Lotus 56, that had both turbine engines and 4WD, as well as the 1969 4WD-Lotus 63 that had the standard 3-litre V8 Ford Cosworth engine. Matra also raced a similar MS84, and McLaren entered their M9A in the British Grand Prix, while engine manufacturers Ford-Cosworth produced their own version which was tested but never raced. All these F1 cars were considered inferior to their RWD counterparts, as the advent of aerodynamic downforce meant that adequate traction could be obtained in a lighter and more mechanically efficient manner, and the idea was discontinued, even though Lotus tried repeatedly. Nissan and Audi had success with all-wheel drive in road racing with the former's advent of the Nissan Skyline GT-R in 1989. So successful was the car that it dominated the Japanese circuit for the first years of production, going on to bigger and more impressive wins in Australia before weight penalties eventually levied a de facto ban on the car. Most controversially was the win pulled off at the 1990 Macau Grand Prix where the car led from start to finish. Audi's dominance in the Trans-Am Series in 1988 was equally controversial as it led to a weight penalty mid season and to a rule revision banning all-AWD cars, its dominance in Super Touring eventually led to a FIA ban on AWD system in 1998. New 2011 24 Hours of Le Mans regulations may revive AWD/4WD in road racing, though such systems are only allowed in new hybrid-powered Le Mans Prototypes. One example is the Audi R18 e-tron quattro (winner of 2012 race, the first ever hybrid/4WD to win Le Mans), utilizing an electric motor in the front axle while combining the engine motor in the rear. Medium-duty trucks and Heavy-duty trucks have recently adopted 4×4 drive-trains. 4×4 medium-duty trucks became common after Ford Motor Company began selling Ford Super Duty trucks. The Super Duty trucks shared many parts between the light duty and medium duty, reducing production costs. The Dana 60 front axle is used on both medium- and light-duty Super Duty trucks. Furthermore, the Big Three share/shared parts between the companies reducing costs. The Dana S 110 is currently being used for the rear drive, under Ford and Ram's medium-duty trucks. The Dana 110 was also used on the General Motors 4×4s as well. Ram Trucks began selling medium-duty trucks, 4×4 and 4×2, in 2008. General Motors sold a 4×4 for model years 2005-2009. Volvo introduced the Model 646 four-wheel drive backhoe loader in 1977. Case Corporation followed suit in the U.S. in 1987. In engineering terms, "four-wheel drive" designates a vehicle with power delivered to four wheel ends spread over at least two axles. 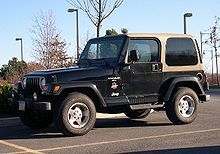 The term 4×4 (pronounced four by four) was in use to describe North American military four-wheel-drive vehicles as early as the 1940s, with the first number indicating the number of wheel ends on a vehicle and the second indicating the number of driven wheels. Trucks with dual tires on the rear axle and two driven axles are designated as 4×4s despite having six wheels because the paired rear wheels behave as a single wheel for traction and classification purposes. True 6×6 vehicles which have three powered axles, and are classified as 6×6s regardless of how many wheels they have. Examples of these with two rear, one front axle are the 6-wheeled Pinzgauer, which is popular with defense forces around the globe, and 10-wheeled GMC CCKW made famous by the U.S. Army in World War II. 4-wheeler (or four-wheeler) is a related term applying to all-terrain vehicles, and not to be confused with four-wheel drive. The "four" in the instance referring to the vehicle having four wheels, not necessarily all driven. Prompted by a perceived need for a simple, inexpensive all-terrain vehicle for oil exploration in North Africa, the French motor manufacturer Citroën developed the 2CV Sahara in 1958. Unlike other 4×4 vehicles which use a conventional transfer case to drive the front and rear axle, the Sahara had two engines, each independently driving a separate axle, with the rear engine facing backwards. The two throttles, clutches and gear change mechanisms could be linked, so the two 12 hp (9 kW) 425 cc (26 cu in) engines could run together, or they could be split and the car driven solely by either engine. Combined with twin fuel tanks and twin batteries (which could be set up to run either or both engines), the redundancy of two separate drive trains meant that they could make it back to civilization even after major mechanical failures. Only around 700 of these cars were built, and only 27 are known to exist today. BMC experimented with a twin-engine Mini Moke (dubbed the "Twini Moke") in the mid-1960s, but never put it into production. This made advantage of the Mini's 'power pack' layout, with a transverse engine and the gearbox in the engine sump. Simply by fitting a second engine/gearbox unit across the rear, a rudimentary 4×4 system could be produced. Early prototypes had separate gear levers and clutch systems for each engine. Later versions sent for evaluation by the British Army had more user-friendly linked systems. In 1965, A. J. M. Chadwick patented a 4WD system, GB 1113068, that used hemispherical wheels for an all-terrain vehicle. Twenty years later, B. T. E. Warne, patented, GB 2172558, an improvement on Chadwick's design that did not use differential gear assemblies. By using near-spherical wheels with provision to tilt and turn each wheel co-ordinatively, the driven wheels maintain constant traction. Furthermore, all driven wheels steer and, as pairing of wheels is not necessary, vehicles with an odd number of wheels are possible without affecting the system's integrity. Progressive deceleration is made possible by dynamically changing the front-to-rear effective wheel diameter ratios. Suzuki Motors introduced the Suzuki Escudo Pikes Peak Edition in 1996. Earlier Suzuki versions were twin engined, from 1996 on the engine is a twin-turbocharged 2.0 L V6, mated to a sequential 6-speed manual transmission. Chrysler's Jeep Division debuted the twin engine, 670 hp (500 kW) Jeep Hurricane concept at the 2005 North American International Auto Show in Detroit. This vehicle has a unique "crab crawl" capability, which allows it to rotate 360° in place. This is accomplished by driving the left wheels as a pair and right wheels as a pair, as opposed to driving the front and rear pairs. A central gearbox allows one side to drive in the opposite direction to the other. It also has dual Hemi V8s. Some hybrid vehicles such as the Lexus RX400h provide power to an AWD system through a pair of electric motors, one to the front wheels and one to the rear. In the case of the AWD model version of the Lexus RX400h (and its Toyota-branded counterpart, the Harrier hybrid), the front wheels can also receive drive power directly from the vehicle's gasoline engine as well as via the electric motors, whereas the rear wheels derive power only from the second electric motor. Transfer of power is managed automatically by internal electronics based on traction conditions and need, making this an all-wheel-drive system. The 4RM system used in the Ferrari FF in 2011 is unique in that it has a rear transaxle with secondary front transaxle connected directly to the engine. The car operates primarily as a rear-wheel drive vehicle. Clutches in the front transaxle engage when the rear wheels slip. Drive to the front wheels is transmitted through two infinitely-variable clutch packs which are allowed to 'slip' to give the required road wheel speeds. The front transaxle has three gears, two forward, and reverse. The two forward gears of the front transmission match the lower four forward gears of the rear transmission. It is not used in higher gears. The connection between this gearbox and each front wheel is via independent haldex-type clutches, without a differential. Due to the difference in ratios the clutches continually slip and only transmit, at most, 20% of the engine's torque. Chevrolet Rounded-Line K Fleetside, K Stepside, K Blazer, and K Suburban - permanent four-wheel drive (1973-1979) two-speed New Process 203 transfer case, center differential with 50:50 torque split and lock. An Eaton Automatic Differential Lock was optional for the rear hypoid differential. Dodge Power Wagon - permanent four-wheel drive (1974-1979) two-speed New Process 203 transfer case, center differential with 50:50 torque split and lock. Ford F-Series - permanent four-wheel drive (1974-1979) two-speed New Process 203 transfer case, center differential with 50:50 torque split and lock. GMC Rounded-Line K Wideside, K Fenderside, K Jimmy, and K Suburban - permanent four-wheel drive (1973-1979) two-speed New Process 203 transfer case, center planetary differential with 50:50 torque split and lock. An Eaton Automatic Differential Lock was optional for the rear hypoid differential. Full size Jeeps with Borg Warner QuadraTrac: limited slip center differential, 50/50 locked center differential. Low range could be used in locked or unlocked mode, allowing for use of low range on pavement. Lada Niva (VAZ-2121) - full-time 4WD using open center differential. Transfer case with high/low range and manual central diff lock. Low range selectable in locked or unlocked mode, allowing use on pavement. Lexus RX300 -viscous coupling across the otherwise open center differential. Mercedes-Benz Unimog (locking center and rear with up to 10 low range gears). Range Rover Classic 1970–1995 all full-time 4WD either plate LSD, manual lock or Ferguson viscous centre differential. Subaru - manual transmissions come with 50/50 viscous-type center differential; performance models include a planetary differential with computer regulated lockup; automatic transmission models have an electronically controlled variable transfer clutch. The above systems ending with "#" function by selectively using the traction control system (via ABS) to brake a slipping wheel. Ford Explorer - Ford's full-time shift-on-the-fly Intelligent 4WD System (I-4WD) on the 2011 Explorer with Terrain Management System and RSC (Roll Stability Control), Curve Control functionality, HDC (Hill Descent Control) and HAA (Hill Ascent Assist). Mitsubishi Outlander (2003–2006) independent front and rear axle coupling, and Active Center Differential. Saab 9-3, Saab 9-5, Saab 9-4X (Saab XWD). Subaru Legacy, Outback, Impreza, Forester, Tribeca automatic transmission models: mechanical front drive, clutch coupled rear axle. 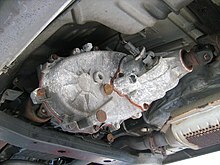 Note: the above all function like 2WD when multi-plate clutch coupling is not engaged (with exception of Subaru models), and like 4WD highrange in a part-time 4WD system when the clutch is engaged (usually by computer although some allow manual control). Some in this category have varying degrees of control in the torque distribution between front and rear by allowing some of the clutches in a multi-plate clutch coupling to engage and slip varying amounts. An example of a system like this is the BorgWarner i-Trac(TM) system. Note: the Haldex Traction-based car list was created from the list on Haldex Traction corporate web site: Haldex Cars. A version of the BorgWarner ITM3e system is used on 2006 and up Porsche 911TT's. The Borg-Warner ITM 3e is also used in the 2006-now Hyundai Santa Fe and the Hyundai Tucson. In the Hyundais, the ITM 3e acts like a full-time AWD with 95:5 normal torque split. In extreme conditions, the system can be locked in a 50:50 split via the 4WD LOCK button. These are vehicles that have no center differential. Since there is no center differential to allow for speed differences between the front and rear wheels when turning, a small amount of tire slippage must occur during turns. When used on slick surfaces, this is not a problem, but when turning on dry pavement, the tires grip, then are forced to slip, then grip again, and so on, until the turn is completed. This causes the vehicle to exhibit a 'hopping' sensation. Using an engaged part-time 4WD system on a hard surface is not recommended, as damage to the drive-line eventually occurs. ^ a b Mohan, Sankar (12 June 2000). "All - Wheel Drive / Four - Wheel Drive Systems and Strategies" (PDF). Seoul 2000 FISITA World Automotive Congres. ^ Andreev, Alexandr F.; Kabanau, Viachaslau; Vantsevich, Vladimir (2010). Driveline Systems of Ground Vehicles: Theory and Design. CRC Press. p. 34. ^ Dykes, Alex. "Alphabet Soup: 4×4 vs 4WD vs AWD Where's the Differential?". thetruthaboutcars.com. Retrieved 18 December 2015. ^ a b "Surface Vehicle Recommended Practice - J1952 - All-Wheel Drive System Classification". SAE International. October 2013. ^ Walczak, Jim. "4WD vs 2WD: The Differences Between 4×4 And 4×2". about com. Retrieved 7 August 2010. ^ Hyde, Charles K. (2013). Arsenal of Democracy: The American Automobile Industry in World War II. Wayne State University Press. pp. 147–148. ISBN 9780814339527. ^ a b Collard, Chris. "2WD vs AWD vs 4WD". ConsumerReports.com. Consumer Reports Magazine. Retrieved 15 December 2015. ^ Williams, Mark. "4WD vs AWD: What's the Diff". MotorTrend.com. Motor Trend Magazine. Retrieved 15 December 2015. ^ a b Sheppard, Tom (1 September 2005). "Jeep Grand Cherokee 4WD System Breakthrough - 4x... For?". Four Wheeler Network. Retrieved 27 May 2014. ^ "History of Hybrid Vehicles". HybridCars.com. 27 March 2006. Archived from the original on 4 September 2009. Retrieved 25 October 2011. See year 1898. ^ "Lohner-Porsche Mixte Voiturette". Ultimate Car Page. 19 November 2007. Retrieved 25 October 2011. ^ a b "1903 Spyker 60 HP". Retrieved 6 May 2011. ^ "The Novak Guide to the Dana Spicer Model 18 Transfer Case". Novak Conversions. Retrieved 16 September 2012. ^ Allen, Jim (8 May 2016). "FWD Seagrave Model B: One of the First Successful 4x4 Trucks". Fourwheeler Network. Extreme Ventures, LLC. Retrieved 15 February 2018. ^ a b Eckermann, Erik (2001). World history of the automobile. Society of Automotive Engineers. p. 76. ISBN 978-0-7680-0800-5. Retrieved 21 January 2013. ^ Redgap, Curtis; Watson, Bill (2010). "The Jefferys Quad and Nash Quad — 4x4 Ancestor to the Willys Jeep". Allpar. Retrieved 6 December 2014. ^ "History of Innovation". Marmon-Herrington. 2009. Retrieved 2018-05-22. ^ Allen, Jim (2009). Four-Wheeler's Bible. MotorBooks International. p. 21. ISBN 9781616730888. ^ DeLorenzo, Matt (15 February 2014). Dodge 100 Years. MotorBooks International. p. 55. ISBN 9781627880848. ^ "Serial Number Guide". T137.com. Archived from the original on 18 July 2016. Retrieved 15 February 2018. ^ Hyde, Charles K. (2013). Arsenal of Democracy: The American Automobile Industry in World War II. Wayne State University Press. pp. 152–153. ISBN 9780814339527. ^ Taylor, Peter Shawn (19 April 2016). "The Trucks that Beat Hitler". National Post. Postmedia Network. Retrieved 2018-05-09. ^ Winnington-Ball, Geoff (10 March 2002). "CMP Softskin Trucks". Maple Leaf Up.net. Retrieved 2018-05-09. ^ Thomson, Harry C.; Mayo, Lida (2003). The Ordnance Department: procurement and supply. Washington, D.C.: Center of Military History, U.S. Army (Originally published: 1960, Washington, D.C., Office of the Chief of Military History, Dept. of the Army). p. 273/274. ^ Nunney, M J J (2012). Light and Heavy Vehicle Technology (Fourth ed.). Routledge. p. 431. ISBN 9780750680370. Retrieved 21 January 2013. ^ Foster, Patrick (January 2008). "1963 Jeep Wagoneer - Landmark Vehicle". 4 Wheel Drive & Sport Utility Magazine. Retrieved 21 January 2013. ^ Auto Editors of Consumer Guide (25 July 2007). "1966–1971 Jensen FF". howstuffworks com. Retrieved 7 August 2010. ^ Auto Editors of Consumer Guide (29 August 2007). "1978-1979 Jeep Wagoneer Limited". HowStuffWorks.com. Retrieved 5 January 2011. ^ Auto Editors of Consumer Guide (29 August 2007). "1967–1977 Jeep Wagoneer". howstuffworks com. Retrieved 7 August 2010. ^ Calvin, Jean (1974). Rallying to win: a complete guide to North American rallying. W.W. Norton. p. 150. ISBN 978-0-87880-017-9. Retrieved 5 January 2011. ^ Sherman, Don (February 2001). "All-Wheel-Drive Revisited: AMC's 1980 Eagle pioneered the cross-over SUV". Automotive Industries. Archived from the original on 2013-05-01. Retrieved 21 January 2013. ^ Rettie, John (August 1987). "Four-Wheeling Into Your Future". Popular Mechanics. 164 (8): 58. Retrieved 5 January 2011. ^ Sass, Rob (9 March 2008). "A Breed of 4-by-4 Hatched on the Fly". The New York Times. Retrieved 21 January 2013. ^ Padgett, Martin (2004). Hummer. Zenith. p. 26. ISBN 978-0-7603-1863-8. Retrieved 21 January 2013. ^ Foster, Patrick R. "1980-88 AMC Eagle 4wd". Autoweek (archived at amxfiles). Archived from the original on 30 April 2008. Retrieved 21 January 2013. ^ Consumer's Guide, ed. (2005). History of the American Auto. Publications International. p. 532. ISBN 978-0-7853-9874-5. ^ "Celica All Trac and Gt-Four FAQ". Alltrac.net. Retrieved 7 August 2010. ^ a b Kranz, Rick. "All-Wheel-Drive Vehicles Grow in Popularity With Car Shoppers". Edmunds. Retrieved 3 August 2017. ^ Shunk, Chris. "Thirty-percent of new car sales will be AWD by 2015". autoblog. Retrieved 3 August 2017. ^ "Do You Really Need AWD in the Snow?". Consumer Reports. Retrieved 3 August 2017. ^ Peter, Cheney. "The myth of all-wheel-drive and why it can be a deadly trap". The Gobe and Mail. Retrieved 3 August 2017. ^ Loh, Edward (December 2007). "First Look: 2008 Nissan GT-R". Retrieved 5 January 2011. ^ Henry, Allan (1975). The 4-Wheel Drives: Racing's Formula for Failure?. Macmillan. ^ "The 2011 Le Mans 24 Hours Regulations". lemans.org. 6 October 2010. Archived from the original on 13 June 2010. Retrieved 21 January 2013. ^ "Hybrid Tech Dominates The 24 Hours Of Le Mans Endurance Race [VIDEO]". Autoblog.com. ^ "Volvo BM 646 Backhoe/Loader" (PDF). Volvo AB. Archived from the original (PDF) on 22 December 2015. ^ "Instruction Book: Driving, Maintenance, Repair. Department of National Defence, Canada". bcoy1cpb.pacdat.net. 1940. Retrieved 21 January 2013. ^ Melissen, Wouter (1 December 2004). "Citroën 2CV Sahara". Ultimatecarpage.com. Retrieved 21 January 2013. ^ "2009 Ford Escape Hybrid Review and Specs". Edmunds.com. Archived from the original on 1 March 2009. Retrieved 1 August 2009. ^ Horrell, Paul (25 January 2011). "Ferrari FF The inside scoop on Ferrari's new FF". Topgear.com. Retrieved 6 May 2011. ^ Abuelsamid, Sam (26 July 2010). "2011 Ford Explorer puts four-cylinder EcoBoost engine above V6 in pecking order". Autoblog.com. Retrieved 26 September 2010. ^ "Ford - Cars, SUVs, Trucks & Crossovers" (in Spanish). FordVehicles.com. Archived from the original on 30 September 2010. Retrieved 26 September 2010. This page was last edited on 16 March 2019, at 16:18 (UTC).